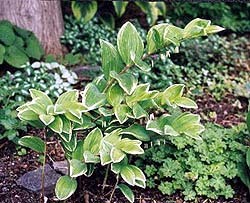 How about an easy to grow, quick to expand, living sculpture of a plant that thrives in shade? It’s Soloman’s Seal, and I never tire of it. Pictured is P. falcatum ‘Variegatum,’ the darling of the spring shade garden. It flowers white quite early in May, charming little bells that hang down like mini-chandeliers. These will be followed by blue-black berries; the leaves take on a golden-yellow hue in the fall. I can’t imagine how disappointed I’d be if my vast areas of shade didn’t have this plant gracefully holding forth everywhere I need a little extra movement and intrigue. There are many varieties to choose from, including a dwarf (P. humile) and a large variety that tops out above three feet (P. biflorum). Soloman’s Seal is a woodland plant, and as such prefers well-draining soil amended with ample organic matter. It will handle some sun and does surprisingly well in dry soil conditions, but is not something to ignore during periods of drought. The thing to remember is that the plant arcs, it leaps out from the base, so allow it to do so over more finely textured plants. It also looks great in the front of the border. Expands quickly without being invasive. Divides without a fuss. Many varieties hardy to Zone 3.